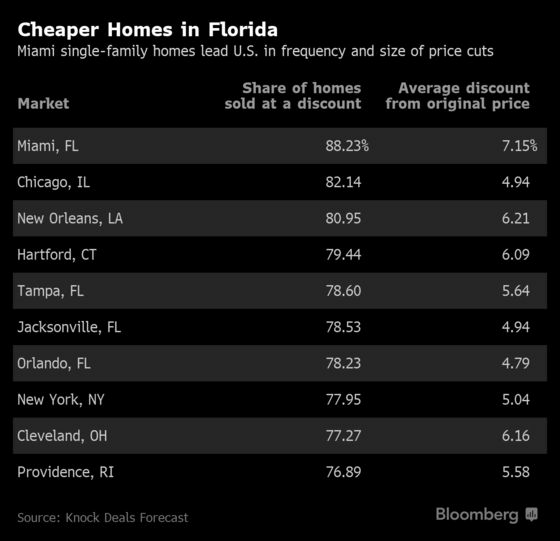 (Bloomberg) -- A housing slowdown is taking hold in some Florida markets, where a growing share of properties sold only after the seller cut the asking price. Miami leads the nation in both the size and frequency of such deals. In Miami, hurt by a pullback of South American buyers, about 88 percent of single-family home sales in the first quarter came after a reduction, according to an analysis by Knock, a startup that helps buyers trade up into their next homes. The top 10 metropolitan statistical areas also included three other Florida cities: Tampa, Orlando and Jacksonville. Miami’s 7.2 percent average discount was also the biggest in the U.S. While Florida has plenty going for it, from sunshine to tax advantages to the flood of retiring baby boomers, it also has plenty of second homes, which tend to suffer first during housing slumps. Buyers are more reluctant to make discretionary purchases as the market cools, said Knock Chief Executive Officer Sean Black.